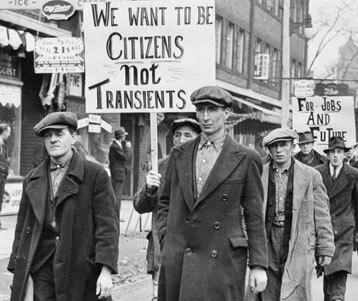 Between 1929 and 1932, as the national and international economies collapsed, Canadians of all social classes were experiencing the most calamitous decline in their incomes ever. The average per capita income fell 48 per cent during the worst years of the Great Depression, with professional incomes declining by 36 per cent between 1928 and 1933. The cost of living fell by 25 per cent. In rural Ontario, one doctor received “twenty chickens, several ducks, geese, a turkey, potatoes and wood” as payment in 1933. In Nova Scotia, Mary Louise Matheson, the daughter and granddaughter of Halifax practitioners, “grew up hearing stories of families and their problems paying their medical bills. Often my grandfather would be paid with fish, lobster, meat, fruits and vegetables” (Helen Heeney, comp., Life Before Medicare: Canadian Experiences [Toronto: Ontario Coalition of Senior Citizens’ Organizations, 1995], p. 61). 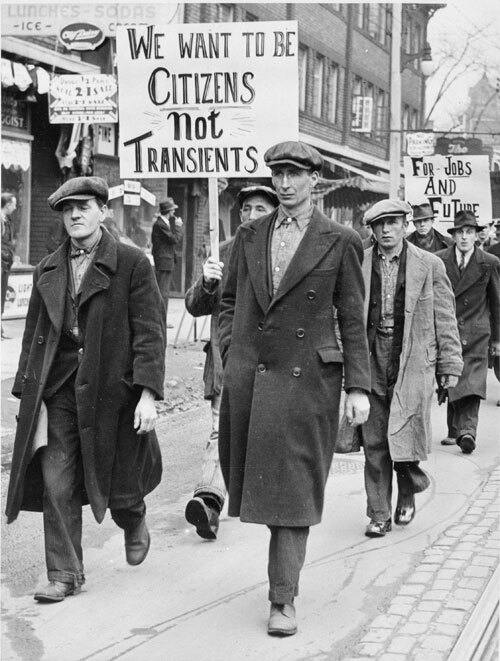 Members of The Single Men’s Unemployed Association march to Bathurst Street United Church, Toronto, circa 1930. When Western economies collapsed in 1929, men travelled the country looking for work.